CS3 Production Premium suite, optimized for Intel Macintoshes and incrementally certified for Leopard, continues Adobe's legacy of excellent, useful and widely-supported applications for video professionals. The new bundle adds a few wrinkles as well. Premiere returns to the Mac after a multi-year absence, Encore is welcomed to the Mac, and Adobe includes Windows-only On Location CS3 in the Mac suite for use in Bootcamp on Intel Macs. On Location CS 3, previously a Serious Magic video product, creates a software digital field monitor on a laptop to setup and record video directly to HDD. It does not run under virtualization solutions such as VMWare or Parallels. This is a capsulated look at the CS3 versions of Photoshop (Extended), After Effects, and Premiere for the Macintosh. New versions of Flash, Illustrator, Soundbooth, Encore, Adobe Dynamic Link, Bridge, and Device Central constitute the rest of the bundle, but aren't extensively discussed. The review was completed shortly after Adobe updated Premiere to add native MXF editing for Panasonic HVX200 users and provided Leopard compatibility. More on that later. Premiere, Photoshop, and Soundbooth are certified for Leopard, and After Effects will be by year's end. However, most reports indicate that everything works fine right now. The New Hallmark: Better Integration. The CS3 applications are more tightly integrated than previously. Premiere and AE project files can be dynamically linked and content updated in each when changes are made in the linked file. There is better interactivity among Encore, Premiere, and AE, and more export options to Flash. In fact, Flash video creation is greatly eased in Premiere, AE and Encore. Adobe CS Bridge expands its media management capabilities and appears less buggy than earlier versions, but its treatment of movie files was inconsistent. For example, Bridge wouldn't preview .mov files without the extension appended. FCP self-contained movies were located, but also wouldn't preview. Better compatibility with QuickTime and the MacOS is recommended. Photoshop CS3 Extended. Photoshop retains its industry leading image editing capabilities. Its nicely redesigned interface eases access to tools, palettes and control panes. Photoshop CS3 includes both new and improved features for video editing professionals. 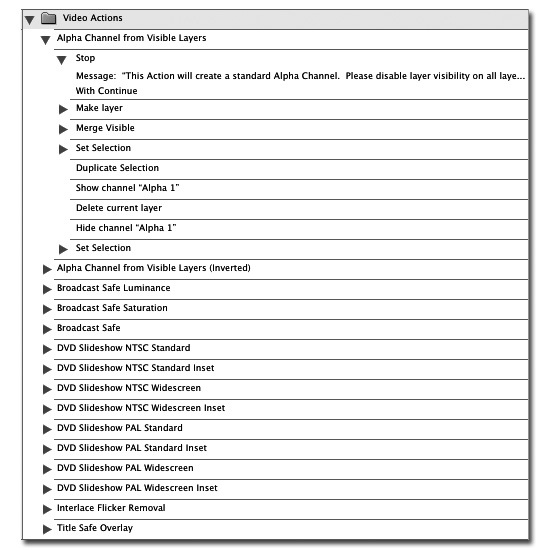 The first is a set of video actions intended to streamline creating video specific files, such as graphics with alpha channels. One action automates creating a lower third alpha channel file for use as an overlay in FCP. Create a graphic with the text layer, select the text layer and play the action. The action created a file that worked perfectly as an overlay into Final Cut Pro. 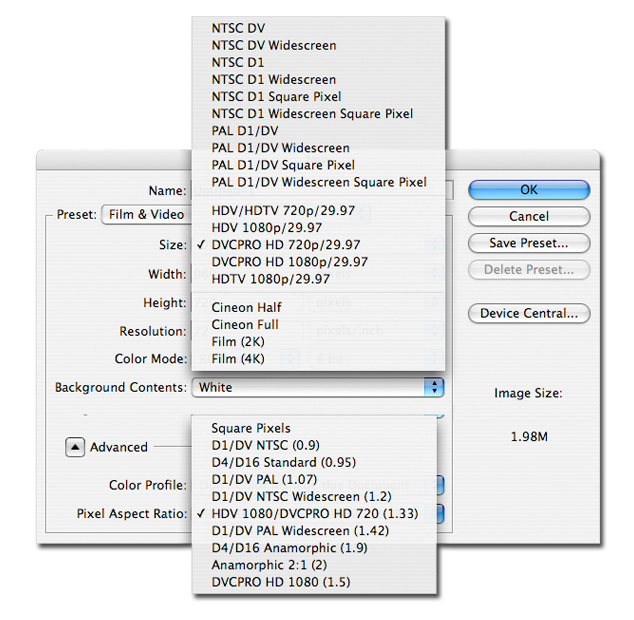 A "New File" dialog box provides several SD and HD video file presets in an improved interface. Adobe has added basic video editing to Photoshop, and CS3 improves and expands on this. There are new import and export capabilities together with tools to edit motion-based content in Photoshop. These include video and 3D rotoscoping, cloning, and export options, among others. Although these motion-based editing tools are impressive, PS is more comfortable when creating and modifying graphics. Premiere CS3. Premiere CS3 Macintosh is identical in features and functionality with its Windows version. It sports new timesaving features and is fully integrated with AE CS and Encore. Adobe recently added native MXF data import to Premiere. Panasonic p2 card users don't have to unwrap MXF video files and rewrap them in QuickTime - which saves production time and HDD space while preserving metadata. Adobe also has integrated Encore CS3, its DVD authoring application, within the Premiere CS3 interface. A basic menu-free DVD can be encoded and burned directly from Premiere using a single menu command. Another new Premiere CS3 feature is the "replace clip" command -- a feature previously available only in AE. Any video clip can be replaced by a substitute clip by dragging the new clip over the old clip with the option key selected -- the new clip automatically inherits the attributes, filters, and FX applied to the original clip. By comparison, FCP requires a copy of the attributes of the original clip, and then a delete and insert procedure. Adobe's improved time-remapping function creates transitional speed ramp up/downs on clips. Clips can be reversed and frame blended to create a more natural look. New search options are available for assets in the project pane and individual asset bins. Searches can be filtered by notes, frame rates, in/out points, client and media file path, and other criteria. One useful feature is the capability to have two project panels opened simultaneously. Bin behavior preferences can also be set in Premiere. Encore CS3, Adobe's DVD authoring package, has been tightly integrated with Premiere CS3. As stated earlier, a basic looping DVD can be created and burned without ever leaving Premiere. Or you can export directly to Encore to author a DVD with menus, create double layer DVDs, or blu ray high definition DVDs with either h.264 or MPEG-2 encoded files. Unfortunately, I did not have a blu ray burner to test this capability. HD DVD is not supported, but exporting to Flash SWF format IS -- a nice feature and consistent with Adobe's product offerings. There are options to export video to the Device Manager to test playback on various mobile devices. Premiere also is tightly integrated with Photoshop CS3. For example, a multilayered PS file imports as individual layers or as merged sequence into Premiere. Individual PS layers retain the same placement and stack order as created in PS and with the same layer names. After Effects CS3. The AE CS3 release is arguably the most substantial of the Production Premium suite. The new version improves suite integration, provides new animation features, export choices, color management and multi-core processor options. The application retains its historic streamlined workflow and adds a few new video specific and content creation capabilities. Shape layers are new vector-based drawing tools that differ in form and purpose from pixel-based image layers. Shape layers can be used to create vector graphics such as logos or to mask a video layer. These layers are fully editable and scalable without resolution loss. 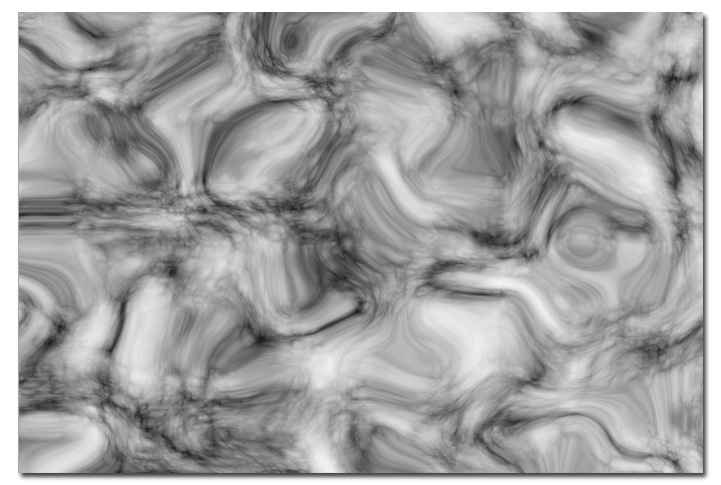 Most shape parameters, such as fills or strokes, can be animated or offset to create interesting effects, i.e. an offset stroke appears similar to a theater's moving bulb marquee. If a path operation is appended to shape layer, even further creative capabilities are possible. "Repeater" operations duplicate an existing shape similar to the replicator in Motion. The shapes can be directly drawn into the project rather than applied to a solid -- a significant timesaver. After Effects' innovative puppet tool provides simple tools to organically deform and animate static/2d objects. The tool and its operation is reminiscent of the inverse kinematics capabilities for models in 3D programs, but operates in 2D space. It is impressive. Once puppet points are assigned to a pixel graphic, the tool is used to key-frame movement over time. AE does all the interpolation between keyframes. Alternatively the object can be animated in real time by manually moving it with the puppet tool as the sequence plays. Adobe built Motion Sketch into the puppet tool's capability to achieve this. The new Overlap and Starch tools provide additional functionality to the puppet tool. Content creation has been improved, and the preeminent new tool is Brainstorm. 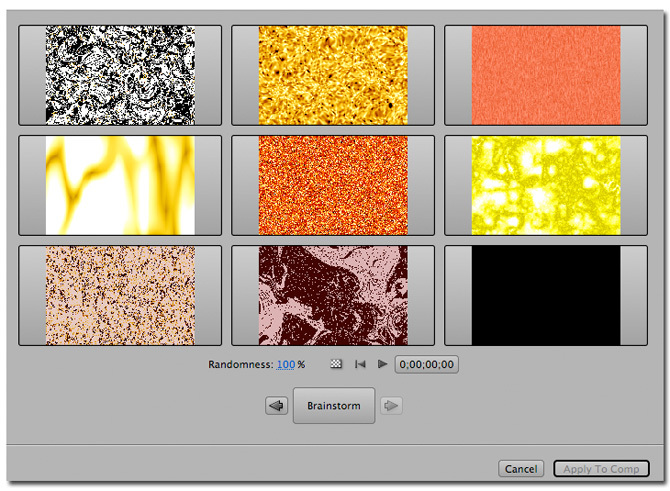 Brainstorm operates on a layer, graphic, text, or video to which two or more filters have been applied. It automatically randomizes the parameters of the combined filters and displays alternative results on a separate screen like the Filter Gallery does in Photoshop. All filter parameters can be used to randomize, or you can elect which parameters you wish from the filters. Fantastic for content creation. Text effects now include 3D character animation, all of which can be animated along the Z-axis. AE CS3 is thoroughly integrated with its companion programs. Photoshop layer styles and blend modes are now supported within AE CS3 and can be animated. There are new export features to Device Central, improved flash export and integration, and substantial performance improvements for multi-core processors. Once the multi-core preference is set, AE CS3 will render multiple frames simultaneously using separate cores depending on available RAM. A MacPro 2.66 GHz dual core configured with 5 GBs of RAM substantially improved RAM preview times. AE's new color management project preference automatically conforms imported still and video assets to the same color management work space. Dozens of color working spaces are provided for SD, HD, and the web. Conclusions. There is a lot here, and this review barely touches on the new features of Production Premium suite. The CS3 versions of Illustrator, Encore, Flash, Soundbooth, On Location, Adobe Dynamic Link, Bridge CS 3, and Device Central also have incidental and dynamic application to video production. The suite remains a bargain, even at its price, for its diversity, and capability within the video production workflow. Adobe offers a variety of upgrade paths from previous users. Comparing this suite to Final Cut Studio 2 is both inevitable and unnecessary. Each has special strengths, and shortcomings, but both remain tools in a video professional's arsenal. Adobe CS3 Production Premium Suite is an exceedingly diverse, mature and capable one.